Flyline solar direct current system is best way of converting solar sun light power to a direct current. 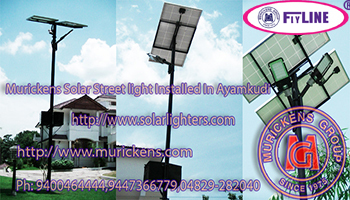 It can be used any where on earth where sun light is available and there is no expenses and headache for wiring or cabling, It is a fully automatic solar system most suitable for Street Lighting, Highway lighting, path way lighting, parking-up lighting, Campus Lighting, Hoardings, and Yard Lighting, Muricken's group developed this with all advanced modern features. ► DC volt out put 12V or 24V. ► Ideal for streetlight, garden light. ► Automatic control system. ► Power consumption is very low and get very good back up. ► We can charge the battery with the help of solar cell. ► Initial coast is also very low. ► No further expense. ► Low maintenance.